At this point, whether you’re a gamer or not, there’s a good chance that you’ve at least heard about Fortnite. This free-to-play game has taken the world by storm and has ended up earning the company hundreds of millions of dollars through in-game purchases. Fortnite has made its way to PC, Macs, game consoles including the Nintendo Switch, and even Apple’s iPhone. But what about Android? The good news is that Fortnite for Android is here. Unfortunately, not without some caveats. First, you need to have a supported Samsung device at least until August 12th. Second, this beta seems to have some serious performance issues. Note: I’m a long time Fortnite player on the PC, but also tested the game out extensively on Apple iPhone before the release of the Android version. Our team also has played the Android version on several devices ranging for the S4 Tab to the Galaxy S9 and older devices like the S7 Edge. Unfortunately, the experience just doesn’t live up to what you’d get from PC or even Apple’s iOS version. I have been a long-time Fortnite player primarily playing on my PC. To get the most out of the game on that platform, I have had to rely on a reasonably high-performance CPU and GPU. With my current setup, I have no issues with lag or graphics. So when I started playing Fornite mobile first on an iPhone, I was surprised by the fact that the gameplay wasn’t garbage. While graphics weren’t nearly at the level found on consoles or PC, they are on par with other hit mobile games. But what wass urprising is that performance didn’t take a hit either. You have to remember that these games are filled with up to 99 people at a time that are all participating in a single match. The same solid performance doesn’t apply to Fortnite for Android, unfortunately. First, the game is capped at 30fps even on newer devices like the Galaxy S9 and Tab S4. Second, the graphics are considerably tuned down from the iOS version, unless you are willing to put up with extremely bad frame rates. That’s not all. While this is true for the iOS version as well, this game eats up a phone’s battery life. In my testing, I was finding that every match was draining my phone’s battery by up to 10 percent or more. I get that mobile games are supposed to help people pass the time and have fun on their phones, but when half a dozen matches drain most of a battery, you have to start thinking if it’s worth a dead phone. Secondly, I can’t recommend playing this game when you’re not on WiFi. As previously mentioned, Fortnite is a live multi-player game that requires a constant data connection to the other 99 users playing in a match. This demand means you will start to drain your data allotment provided by your cellular carrier. If you can look past the performance issues, the game is still playable, just frustrating. So let’s look further at gameplay, game modes, and the rest. 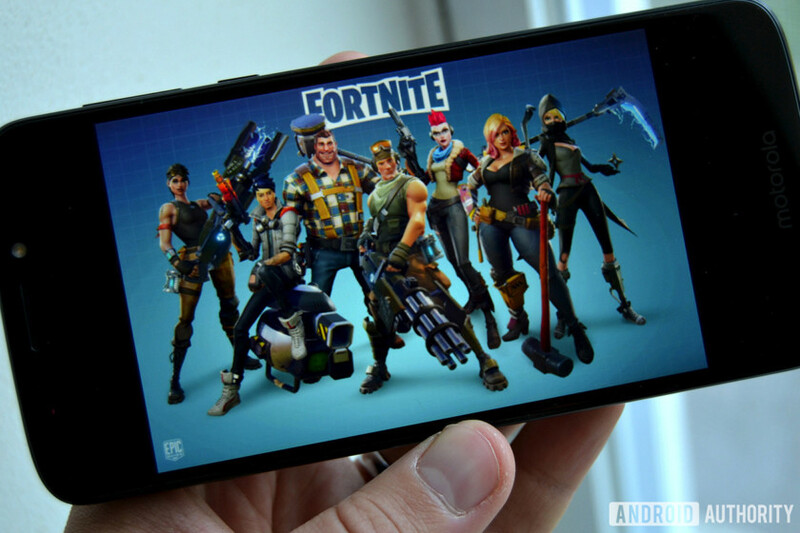 Fortnite for Android is a battle royale genre game where the objective is to be the last player standing. Each match kicks off with every character in a flying bus that takes a random route over an island with multiple types of terrain and cities. At any time during this flyover, players can jump to the ground and begin their journey. Fortnite is perfectly made for users who prefer to either play by themselves or with their friends. To achieve this, Fortnite offers several different default game modes. These include solo, duos, and squads. As the names suggest, solo is for when users want to play as a team of one, duos are for teams of two, and squads allows for up to four people to play together at once. What’s nice is that if you want to fight alongside other players but don’t have any friends online, you can automatically be paired together with other people playing the game. Outside of these default modes, Fortnite occasionally introduces modified game styles. For example, at the time of this writing, the battle royale has a 50 V 50 mode where players are put on a team of 50 characters and are given the primary goal to eliminate all opposing members. Other past examples are shotgun and sniper only game modes where players are only able to pick up and use those classes of weapons. If a player wants to survive, they’re going to need to move around the map and either find guns and explosives or open crates that provide a random array of items that the user might want. Additionally, players should stock up on healing items and shields. As the character can take damage from opposing gamers, they will want to reheal when possible. The moment a new Fortnite round starts, everyone is on the same playing field. This means that no one player will have better powers, weapons, or capabilities when dropping from the bus. The only advantage someone might have is their own experience gained by previously playing the game. So then why does everyone look different from one another? The simple answer to this is that people have either unlocked or bought character customization items. The look of each character is the primary difference between users. When players are new to the game, they’re given several basic-looking avatars that aren’t fancy. As they advance, a limited number of characters can be unlocked for free. But the way most people change their look is by buying different outfits from Fortnite. I will explain the in-game currency in a bit, but basically, Epic Games releases different looks every 24 hours or so and people have the opportunity to purchase them. But don’t worry, if something disappears from the store before it can be bought, it will show back up in several weeks. In addition to outfits, players can customize their Fortnite avatar’s appearance by changing the look of their harvesting tool, glider, contrail, and more. Also like outfits, players can unlock or purchase different designs and styles. Lastly, one of the most popular aspects of the game is the emotes. Whether someone is celebrating a kill or just messing around, users can launch into a dance or action. To purchase all of these customization options, users have to use a virtual currency called V-Bucks. Throughout the game, users gain experience points which then progresses them to higher levels. Every once in a while, one of the rewards for advancement is 100 V-Bucks. The problem with this is that everything in Fortnite’s virtual store costs at least 500 V-Bucks and can go up to at least 2,000 V-Bucks. So if players want a new outfit, emote, or whatever, the only real option is to buy the virtual currency with real money. The exchange rate is roughly $1 to every 100 V-Bucks. To motivate players to spend even more money, Fortnite gives “bonus” V-Bucks when they buy large sums of the currency. Remember, Fortnite is a free-to-play game which means users technically never have to spend a single dollar to play it. By buying V-Bucks and then exchanging those for character customizations, those gamers aren’t getting any advantage while playing. Having the different outfits and accessories is more of a social experience than anything else. To make Fortnite more enjoyable, and make it more than just a game about killing other characters, Epic Games includes weekly challenges that players can complete to level up faster and unlock new outfits, accessories, and more. Each season consists of 10 weeks and each weekly challenge tests a player’s skills. Ofcourse, Fortnite wants to try to make money off of its free game. So in addition to buying customization features for avatars, users can purchase 25,000 V-Bucks and unlock the Battle Pass. When buying this upgrade, players are unlocking more weekly challenges and gain access to more free items while leveling up. Again, there’s no in-game benefit gained by spending $25 every 10 weeks, but it helps users level up faster and get “free” stuff. Just like many other mobile video games, all of the controls to navigate the virtual world are at your fingertips. There are two gesture areas in the lower two corners that are used to move the character around. User’s left thumb will be used to walk or run forward, backward, or left or right. The right thumb is what allows the player to look around. But as Fortnite is much more than just running around, there are a lot more buttons placed around the screen. Two easy-to-reach buttons near each navigation area let the user either swing the harvesting tool or to shoot a gun. Having the two buttons in an easy-reach location makes it so users can quickly react when they see opposing players or want to collect materials. As this transition isn’t always the fastest when in a combat situation, the mobile game has a setting that can be turned on that automatically has the character shoot its weapon when an opponent is in their crosshairs. I found this extremely useful because it lets the player focus their attention on keeping the enemy directly in front of them instead of having to move and shoot at the same time. Two other static buttons are for crouching and jumping. These are strategically placed above the right thumb so that they can easily be tapped on while running or moving around. Picking up weapons and supplies is easier on mobile when compared to other platforms. Instead of hitting a particular button, players have to run over the item and it will be collected. If the gamer’s inventory is full, they will then have to tap on the item and it was be exchanged for whichever weapon is selected in their inventory. One significant part of Fortnite that separates it from other battle royale games like PUBG is the ability to build structures. Using the material that was farmed utilizing the harvesting tool, players can build simple walls, or they can practice and end up making a skyscraper. I will say that this is much easier to do on other platforms. On mobile, while trying to move and avoid enemies, users have to lift one of their hands off the screen, press a button to switch into building mode, select the desired material and desired structure type (walls, floors, stairs, or roofs), and then hit build. This process can be extremely cumbersome on mobile, and I found myself not even bothering with the effort while playing. Fortnite is a very audio-focused game. By this, I mean that a lot of the strategy while playing comes from listening for other players and chests. But in this case, when users are playing on mobile, they might not have the best speakers on their phones/tablet or be able to have the sound on at all. To help with this problem, Epic Games includes on-screen indicators to help direct or alert players about nearby sounds. Coming from the PC, I found these indicators to be handy. Even though Fortnite does an excellent job at pinpointing where a sound is coming from audibly while wearing headphones, it can still be challenging to judge it accurately. These indicators fix this problem on mobile. For people like myself who have been playing Fortnite for months on a different platform, it’s nice to have the game available while on the go. Unfortunately, the experience just isn’t great with the Android version yet. Keep in mind this is still a beta, so a few updates could change everything. For now, you’re likely better off waiting or sticking to the game on another platform. So that’s it for our first look review of Fortnite for Android. We’ll be sure to revisit when the game gets a few updates under its belt. What do you think of the game, have you had the same performance issues? Let us know in the comments.